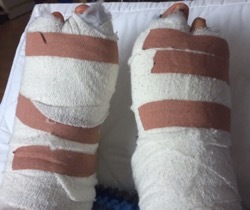 Well, it’s now two weeks since my operation and, as the title suggests I’m curious, wondering what’s going on underneath those bandages. The heavy bleeding in one foot of the first week has, thankfully, stopped, but there is a general feeling that there’s still an intermittent something going on, usually if I’ve been upright for too long. And oh my goodness, do my feet tell me if that happens! My feet literally feel like they’re going to explode and the toes change from a pale pink to a beetroot colour and start to numb. It doesn’t take long for that to happen, three minutes or so and then it’s get them elevated again, quickly! The elevation “thing” is recommended ATM for about 20 hours a day so, including sleeping, which is uncomfortable, to say the least. I’m also feeling woozy if I try to sit upright without my feet elevated in line with my nose so any sort of computer work is completely out and housework is a no-can-do. Sometimes having low blood pressure is a bonus, it’s not currently. Quick feet pic, next week I’ll have my first check-up since the op and my A&E visit a day later so, I’m mega curious to know a) if the op was successful and b) just how battered and bruised they look! As far as flexibility goes, I can move my big toes and the one immediately next to them. They really hurt at times – especially if I’ve gone up and down the stairs – so it’s a case of moving them about, riding out the numb/aching/jabbing pain until it goes, I’m not a fan of pain killers unless absolutely necessary, I’d rather feel whatever is going on. Baths are “interesting”, I can’t get the dressings wet so kind of am half-in, with my feet hanging over and manage a quick wash before my feet go angrily numb and tell me to hoist myself out and get dry, dressed and elevated. A quick note about jim-jams with lace trim and velcro straps on surgical boots – they don’t mix and cause no end of faff if they get stuck in the velcro, not recommended! Life feels a little less stressful here because D’s home-school transport has finally been sorted out, yay! It wasn’t easy and the Educational Welfare Officer had to contact the head of children’s services to get an agreement as the transport department just stalled. So, we have door-to-door transport from next week and school had sent home some work, so – hopefully – she won’t have missed too much. It irks me that D missed a week of school and this impacted on her emotions and both of our wellbeing but there was no other way around it, I certainly wasn’t going to send her off in an unapproved vehicle and she definitely couldn’t walk it by herself. The EWO described her as “extremely vulnerable” and they weren’t wrong, D’s safety is always my priority. I’ve been very impressed that D has wanted to do the work sent home, mostly maths (3 x, 5 x which she enjoyed) and DIY writing (which she didn’t, writing is a challenge for her) and she’s kept up her reading and flute practice. It’s been half term here and been very low key obviously. T’s been catching up on his sleep and reluctantly fetching and carrying when asked and D has mostly been cuddling. Hubbie has been tiring himself out with working all day and then coming home and having to do dinner etc. It’s not easy to just sit there and not help but I know that’s how it has to be for the next few weeks, the only time we’ve had a bit of a row is when I tried to be independent and dropped something. I am stubborn! This woozy feeling is definitely affecting my concentration, this post has been added to as and when as even just reading a page or so of a book tires me, so much for the Agatha Raisin/new Poirot stories I’d decided I was going to read whilst laid up! Ditto blogging. Perhaps I’ll be able to in the coming weeks. But for now, I’m curious about what’s occurring under those dressings (my #WOTW), hoping that everything is fusing together and healing okay and looking forward to when I can walk again, even if it’s raining I won’t mind, just being upright without a crutch/wanting to fall over will be wonderful!